Are you being cautious or compulsive? This week is Obsessive Compulsive Disorder (OCD) and Anxiety Disorders awareness week. Last semester I blogged about anxiety in general and gave you some tips for managing and access to online resources. So I thought this week I’d share a little about OCD. I’m sure you have all had a moment or two in your life where someone has accused you, or you have accused yourself as being a little “OCD”. Most likely it’s when you want something done a specific way, or you are reluctant to hand over control of a task because you like things done your way. I know that I have definitely been guilty of this. But this isn’t OCD, intact by calling it this we are belittling the experience that those who do have OCD have. If you are wondering, like a lot of people do, where the line is between being cautious or picky or developing OCD here are a few common areas and distinctions which might help. Hand washing – there is a difference between being thorough when washing your hands and feeling compelled to wash them 3 times, or for 6 minutes, or needing to get soap under each fingernail. There is usually also a difference in thoughts, those about wanting to be clean because you are about to go eat, or have just finished gardening are ok but when you are worrying about germs after washing or passing on your germs to others this might be something to seek help about. Overzealous cleaning – It’s ok to want your house or room tidy and spend time each time cleaning up after yourself. But ask yourself how many hours a day are you cleaning? Do you get anxious after you have finished cleaning? What other activities are you giving up on a regular basis so you can keep your house clean? Checking behaviour – everyone double checks things from time to time. I noticed earlier this week I checked I’d locked my car twice because I didn’t recall hearing the lock sound. But ask yourself how often do you double check? Or are you checking things for a certain number of times, for example in patterns of three? Counting – you may count steps going from one place to another, or magazines in the doctors office if you are trying to distract yourself and this is ok. But ask yourself does your counting things bother you? Does it bother someone else? Does it make sense to do it? chances are if it makes no sense and it is bothersome to either you or someone else that it’s heading towards or is more in line with OCD. Fears of violence – we all experience fleeting thoughts of violence from time to time, most commonly for me when I walk across campus during the evening alone (although the CCTV’s make this less daunting now). Experiencing a little fear and anxiety at these types of scenario’s is normal and it prepares the body for the fight or flight process should we need it. But what happens when we start avoiding events or tasks because these worries take over? Or what if you are constantly checking on someone else’s safety because you worry about them? What if the thoughts are becoming more frequent and intense? Of course there are a lot of other signs of OCD, obsessive organisation, unwanted sexual thoughts, dwelling on relationships, having a hatred of a part of your physical appearance and constantly seeking reassurance. If you are worried about a behaviour you have or someone else has don’t dismiss it come and find out more about the behaviour and some strategies that you can use to help you get back to being cautious or picky rather than obsessive or compulsive. Understanding more about the reasons for the behaviour and learning how to change the behaviour could make a huge difference to the way you life your life. So next time you find yourself checking if you locked the car or you are avoiding night time classes because you are fearful of what might happen ask yourself, “How often am I doing this? Is this helping me get what I want from life or is it getting in the way?” If it’s getting in the way then maybe it’s time to seek some help and beat it! Last semester I blogged about setting goals using the SMART goals concept. 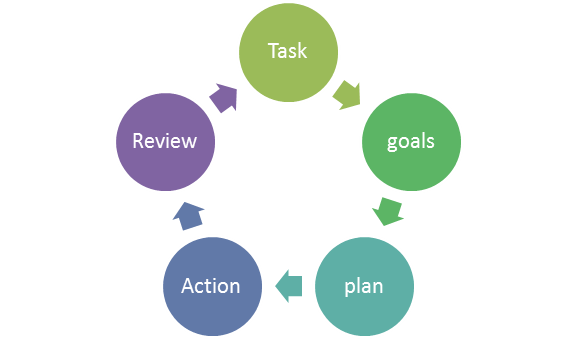 Setting goals and making action plans to help you carry out these goals are essential components of good time management that help you on the pathway to success for the semester. Now I’m not saying that if you set goals and plan that things will go off without a hitch. After all just like rules are meant to be broken, plans are meant to be evaluated and re configured. You may ask why would I plan if I know it might not work? Planning helps give you structure to your goal. Writing it down in a step by step process makes you more accountable and better able to review what went well and what you would do differently next time. To start with you need to define the task – what is it you are trying to achieve? You also need to be able to see where this fits in the bigger picture, so what are your objectives in reaching this and what are the benefits to achieving the goal. The easiest way of thinking about the difference between these two is when we thinking about the task being an individual assessment and the objective or goal being complete and pass the overall subject. When you have this understanding it’s time to break it down further into smaller steps. At this stage you start to think about the when, where, what resources will I need and how I will go about it. So for completing an assessment task you think about when is it due, what steps will I need to take, i.e., literature review, reading resources, planning essay, writing, review and referencing. It is useful to make sure you set individual time frames for each of these processes and fit them into your weekly planner. It’s also a good idea to write the action plan down . The next phase is the action phase. This is actually putting your plan into place. It’s a good idea at this phase to keep a log on your progress so you can reflect on it later. There will be struggles at times with your plan, like not estimating enough time for a task, or forgetting a step in the process. Keeping a log of this will help you when reviewing how it all went. The review is important because you need to be able to learn from the errors and also what worked well so you can use the strategy again for future success. Each tie you refine the process you get better at the skills, but only if you learn from the errors and can see what worked well. Otherwise it’s all a guessing game. There is one final step that isn’t on the diagram above and that is REWARD. Make sure you not only plan to reward yourself at the end of the task, but during the plan as well. It makes sense to use smaller rewards for achieving smaller steps along the way. For example a small chocolate for finishing a literature review versus a weekend off study for completing the whole task! The best time to start planning is before it all starts. So why not use this week before classes start back to think about your plan for the semester. Maybe go through a few practice runs of the planning so that when you get the course outlines next week you are more confident in having a go. Yes that’s right, the mid year break between semesters has come to an end. This can only mean one thing – it’s the week before classes start! A chance to get back onto campus, make sure your enrollment is sorted out, and see what’s new around the campus. You may notice some new faces this semester as we welcome students who are starting a mid year enrollment, or those who are back from a leave of absence or studying abroad. Now that we are back to our regular scheduling, I’ll also be back online blogging about different issues that impact on students, so leave me a message in the comments or send me an e-mail if you want to hear about something in particular. I’ll also be available for Drop-in Skype sessions again. You can find me online Tuesdays 7-8pm, Thursdays 2:30-3:30pm and 8-9pm and Friday 9-10am. You don’t need an appointment to chat with me during these times, you just need to request to add me as a contact, my username is UONonlinecounsellor. If you would prefer to make an individual time to catch up outside of these hours or using Blackboard Instant Messenger then please contact me so we can work out a time. Stay tuned this week, I’ll be talking about making a plan for the semester and how to stick to it!